What: This parenting workshop is developed to help parents with children with learning difficulties, plan and learn different strategies that will help them prepare their children for some of the callings ahead. 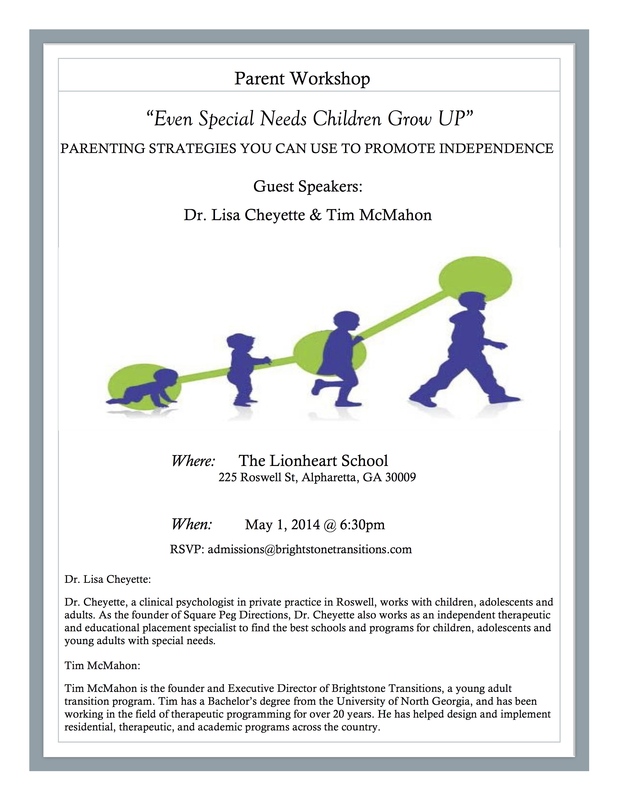 Both guest speakers are among the most well respected in their field and are offering insight from their experiences and specific strategies that parents can utilize to help best prepare their son or daughter for success. Why: The workshop is designed to help parents with children with learning disabilities come together with professionals and to learn techniques, but more importantly to plan for the road that lies ahead with your son & daughter. This will also give families a chance to network with each other and to ask questions of leading professionals in their field. Dr. Cheyette, a clinical psychologist in private practice in Roswell, works with children, adolescents and adults. As the founder of Square Peg Directions, Dr. Cheyette also works as an independent therapeutic and educational placement specialist to find the best schools and programs for children, adolescents and young adults with special needs. To further her skills in the diagnosis and treatment of adults, Dr. Cheyette completed a three-year advanced training program in psychoanalytic psychotherapy with the Atlanta Psychoanalytic Society and the Emory University Psychoanalytic Institute. In 2010, Dr. Cheyette was appointed to the faculty of the Emory School of Medicine as Adjunct Assistant Professor of Psychiatry and Behavioral Sciences. As founder and director of Square Peg Directions, Dr. Cheyette serves families nationally as a specialized independent educational consultant. She helps them locate the most appropriate programs for the educational, emotional, and developmental needs of their children (including teens and young adults) with autism and other social challenges. She is an Associate Member of the Independent Educational Consultant Association (IECA) and a Professional Member of the National Association of Therapeutic Schools and Programs (NATSAP). Dr. Cheyette received her Bachelor of Arts with Highest Honours from McGill University in Montreal, a Masters in Counseling/Criminal Justice from Northeastern University in Boston, and a Ph.D. in Clinical Psychology from CSPP-San Diego. As a licensed psychologist, Dr. Cheyette is qualified to administer a number of psychological tests including the Autism Diagnostic Observation Schedule (ADOS). Her office also offers testing for other psychological conditions. Tim McMahon is the founder and Executive Director of Brightstone Transitions, a young adult transition program. Tim has a Bachelor’s degree from the University of North Georgia, and has been working in the field of therapeutic programming for over 20 years. He has helped design and implement residential, therapeutic, and academic programs across the country. Tim is married with two children. When not at work, Tim enjoys spending time outdoors and camping with his two daughters. While managing 10 intensive residential treatment programs located in 6 different states across the US, Tim began to realize that there was need for resources to help young adults who despite therapeutic intervention, needed support to move forward. These young adults appear stuck, but are often unable to make plans that allow them to advance. These young adults needed guidance but often did not respond to traditional clinical interventions. It was out of Tim’s passion for helping these young adults, that Brightstone Transitions was born. Tim has a hands-on approach to running Brightstone. Tim personally believes that the key to reaching these young adults is relational. With that in mind, Tim designed Brightstone to be a small, very individualized, program. Tim brings a wealth experience and personal knowledge which he uses to help his clients and families build a foundation for success. He helps Clients clearly define goals and develops plans to work toward those goals. Tim believes in an action oriented approach that moves clients beyond the classroom and into real life experience.